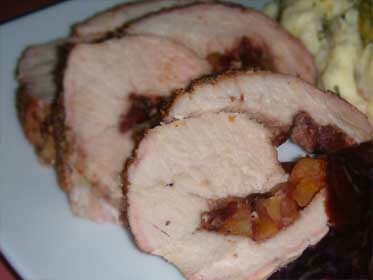 Cap'n Rons: Recipe for Fruit Stuffed, Pork Loin Roast . 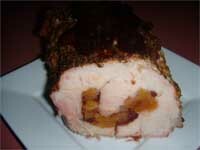 Welcome to Cap'n Ron's, Fruit Stuffed, Pork Loin Roast. 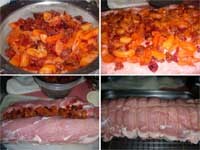 This is a basic recipe for stuffing a pork loin roast. You could easily change the fruit, but I prefer a mixture of yellow and red. 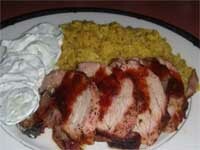 You could also change the wine to a pinot Grigio, for a lighter sauce. Dried Pineapple with Craisins, and Port Wine. Drained, canned nectarines, then make a sauce using Orange Juice, more nectarines, and Pinot Grigio. A Bread Stuffing, as you might make for turkey. Make extra, then cook 1 cup balls on a sheet pan while the meat is resting. Serve with a brown gravy. Fresh apples, spiced with cinnamon and nutmeg, of course you'll need a little sugar. Make a sauce using chopped apples, and an apple flavored brandy. 1. 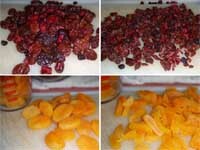 Chop both the dried cherries and apricots, and place them in a non-reactive bowl. 2. Add enough ruby port wine to just barely cover. Using a filet knife, cut a slice equal to about 1/3 the thickness of the meat almost all the way through the meat. Flip the meat around, and make a cut in the thicker side, about 1/2 the thickness, again not cutting all the way through the meat. You should now be able to lay the meat out. 4. 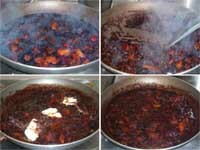 Drain the fruit, reserving the port wine, then place the fruit in a single layer, over the meat. Leave about 1 1/2" open on the side furthest away from you. Don't worry about using up all of the fruit, because you'll be using it in the sauce. Roll up real tight, then tie at 1 1/4" intervals with butcher's twine. 5. Place a rack in an ovenproof baking pan, and spray with an oil. Place the meat on the rack. Spice the meat fairly heavily with the blacken, Kosher salt, and black pepper, then rub in enough oil so that the meat actually looks oily. 6. Pre-heat the oven to 500 degrees, and place the roast inside. 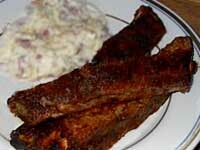 Cook for 15 minutes, then turn down the oven to 300 degrees, and cook for about another hour. 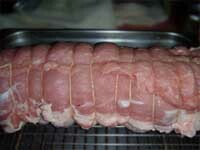 Cook Pork to an internal temperature of 140 - 145 degrees. 7. 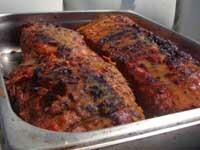 Take the meat out of the oven, and cover with aluminum foil while it rests for at least 15 minutes. 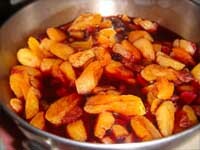 Place the reserved extra fruit, and port wine in a Teflon pan. Add the balsamic vinegar, and the sugar and bring to a boil. Cook this mixture until it thickens to a syrup, and you can draw a spoon or spatula through it and it stays apart. Add the cream, stir it in, then add the butter. The cream will keep the sauce from becoming brittle like candy, and the butter will give a nice shine to the finished sauce. 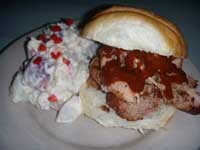 Both add to the richness of the sauce. You can set this aside, then reheat for service. When you re-heat it, do so at a medium heat, and don't let it come to a boil or the butter will separate. 9. Remember to remove the twine before you slice the roast. I've got a bad habit of forgetting to do that, and I end up plating this dish along with a piece of the butcher's twine. 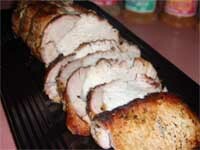 Slice the roast into 3/8" - 1/2" slices, and serve with the sauce.